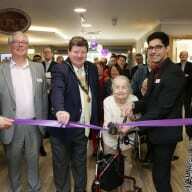 The new luxury care home, which features 72 ensuite bedrooms, has been designed to enable residents to live active and fulfilled lives, while also promoting independence. The care home incorporates space for hobby and leisure activities and includes its own cinema, hairdressing salon café, and private dining room with stunning views of Windsor Castle. Mountbatten Grange home manager, Saad Baig, said: “We were delighted to welcome the Mayor of Windsor and the High Sheriff of the Royal County of Berkshire to officially open the home and mark this important milestone. The Windsor Day Centre was the winner of the Local Heroes competition, which was launched by Mountbatten Grange to celebrate the home’s opening and rewarded local people or organisations who go above and beyond for their community, friends or family. The post Care UK officially opens new Windsor service appeared first on Care Home Professional.